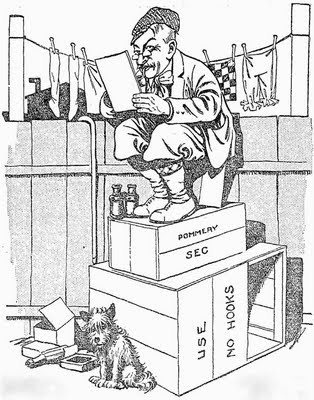 Sunday, October 25 1908 -- Herriman illustrates another in the weekly series of articles by former heavyweight champ Jim Jeffries. This week, Jeffries offers his formula for good health and long life. While Jeffries didn't live to be a hundred as he claimed you could if you followed his regimen -- he died at age 77 -- one must factor in the hard life of a prizefighter and say he did fairly well with his system. PS -- I believe the odd looking fellow in the boxed cartoon above might be Herriman starting to try drawing a 'man-duck', and then running out of time before deadline. Not very long after Joseph Pulitzer had been elected to Congress from a Tammany District, I went to Washington with him. It must be mentioned here that one or two man's-size drinks had the effect of bringing out in him a boyish, noisy boisterousness, a boastful garrulity quite unlike the testiness, asperity and impatience of his later days as recorded by his biographers. On a certain night, when we were leaving the Capitol grounds, he was lit up to the seventh magnitude by a few cocktails—so few that I was actually ashamed of him and embarrassed to painful silence when a policeman appeared and arrested him. J. P. haughtily announced that he was a Member of Congress and bade the cop begone. The officer curtly replied that Congressmen cut no ice whatever with him, and proceeded to hustle his prisoner stationward with considerable rudeness. I touched his arm and murmured: "Say, old man, you don't want to jug this gent! He is Joseph Pulitzer, the owner of the New York World." "Holy Cheesus!" exclaimed the cop. "Why didn't he say so at first? I'll get you a carriage and you can take him home without anybody seeing him." As a Representative, J. P. proved a flivver, for he soon perceived that the owner of the World was far more important than the most eminent statesman, and so he loafed on the job for a space and then abandoned it. He was a competent judge of human nature as a general thing, but he frequently fell a victim to cocky, assertive and flowery conversationalists of the Brisbane, Harvey and Ballard Smith sort. Such men as Col. Jones of St. Louis managed to sell themselves to him by their eloquence alone, and until they failed at their jobs he never seemed to see through their shallow eloquence. After a few years he evolved a scheme of double responsibility for many of his business and editorial heads, with the idea that one would watch the other. They did almost nothing else! The plan was as unproductive as it was mean and clumsy. It produced in time a condition of suspicion, jealousy and hatred, a maelstrom of office politics that drove at least two editors to drink, one into suicide, a fourth into insanity, and another into banking. Even those of his employees who were naturally kindly and of generous instincts were compelled in self-protection to resort to unseemly tricks. Brisbane, who hated me cordially, frequently took occasion to protest that my pictures were coarse and vulgar and to insinuate that I could not draw. J. P., who loved to have his staff at actual enmity, laughed and retorted: "He draws circulation, and that's enough!" I earned Brisbane's enmity by pure frankness and kindness of heart, for I admired his ungodly nerve and flippant audacity. He had brought to me a Paris paper with the suggestion that I borrow an idea and Americanize it. Rather impatiently, I counseled him to pretend to have an original idea occasionally. He had recently been fired from the Sun and had not yet completely grown a new hide, and my friendly criticism galled him, but, quite characteristically, he did not openly resent it. It was one of his duties to write daily reports to J. P. concerning the conduct, opinions and general usefulness of members of the staff; whenever he aspersed my value to the World, J. P. would promptly send them to me in order to keep my tropic New Jersey blood in circulation. I imagine he took a keen enjoyment in this, for he rarely neglected it. Arthur and I had but one open break. That was in the foyer of the new World Building, and everybody deserted his post on the ground floor in order not to be a witness to the shedding of blood between two hard-riding, hard-hitting, hard-bluffing semi-professionals who had worked with John L. Sullivan, Arthur Chambers, Jim Corbett, Billy Muldoon and Bob Fitzsimmons. There were hard words in plenty, but no actual blows. Another fight long before this had become traditional in Newspaper Row. This was the famous mill between Pulitzer and Joseph Howard, Jr., and I was the innocent cause of it. Howard was then, as Brisbane is now, the most spectacular and highest-salaried newspaper man of the time, an indispensable figure at all first nights at the theater, a tall, handsome, jaunty fellow of perhaps forty-five, who always wore a low-cut waistcoat displaying an immaculate shirt bosom, and whose assertive and independent manner, with its total lack of veneration for wealth and position, was a continual protest against the disesteem under which all newspaper men labored in those days. He once introduced me to the eminent impresario Henry E. Abbey, and upon Abbey very patronizingly nodding and saying: "Aw, glad to meet yah," Howard snorted and exploded: "'Glad to meet yah!' Why, you big stiff," he echoed, "that kid has more brains in his little finger than you have in all your big fat body!" and Abbey then looked at me as if I were human. Howard employed two stenographers, a blonde and a brunette, in his office somewhere below Fulton Street, and was under a large retainer from a great insurance company, it was said, owing to the fact that he possessed most damaging information concerning its methods. Pulitzer had engaged him at the incredible salary of seventy dollars a week to write about what he pleased. 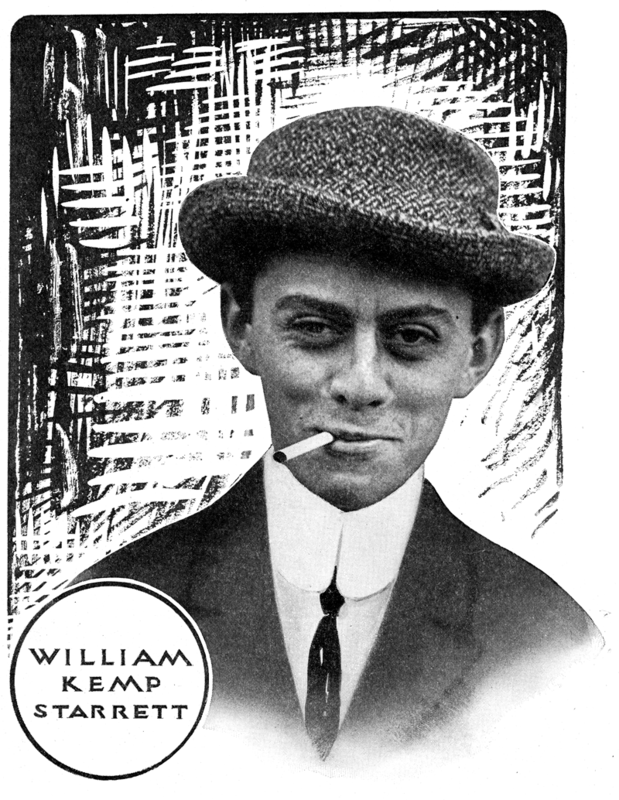 He was the progenitor of the modern eight-cylindered publicity agent. On first nights he never entered the theater until all were seated, and then his entrance was as important—and as conspicuous—as the rise of the curtain. In the Winter of 1885 Erastus Wiman, a rising financier of Canada who was just then hypnotizing New York, invited a number of prominent citizens to be his guests at the Montreal Ice Carnival. Among them I remember Elihu Root, then Pulitzer's attorney, District Attorney John R. Fellows, Charles A. Dana, William J. Arkell of Judge, Keppler of Puck, Thomas Nast of Harper's and many others—there was actually a trainload—and, among them, myself. On my receipt of the invitation, I informed Pulitzer of it and he instantly told me to go, also to draw a hundred dollars of expense money from Mr. Shaw, the cashier, and, if possible, send on a story about the trip. Elated at the prospect, I hustled with my daily work in order to be ready for a preliminary dinner to be given by Wiman that evening at the Metropolitan Hotel, then the best hostelry on the continent. Two hours later Howard sauntered into the editorial rooms, where J. P. happened to be, and informed him that he was going to Montreal with Wiman next morning. J. P. said: "No! McDougall is going with that crowd, and we can't afford to have two high-priced men off on one job of that sort." Joe instantly flared up, and in a minute the office was fogged with recrimination, insinuation and damnation. In another minute the two tall black-attired figures were past words and their long arms were flailing the air. Neither of them had the least knowledge of the fistic art, and the spectacle resembled a combat between two sandhill cranes. Both lost their eyeglasses and were practically helpless and harmless, but each did his best until the bystanders, fearing that the ancient and tottering building could not long withstand such unusual strains, interfered and separated them. Howard left the office and never returned. No decision. Edward S. Van Zile and myself are probably the only surviving witnesses of that memorable and ludicrous battle of the Titans. It was a fiasco, but it was far more uplifting than the ignoble horsewhippings and the like to which many an editor of the previous decades, such as James Gordon Bennett, had to submit occasionally. It was, at least, in the line of that elevation of our craft which in time led to our sitting at the guests' table at banquets and addressing the Chamber of Commerce and the Rotary Club on a level with ambassadors, chewing-gum dealers, movie magnates and owners of department stores. Such exhibitions are rare indeed, and hence long treasured in newspaper offices. They do much to cheer and encourage the hard-working toilers. Newspaper Row cherishes a short list of such sudden and brief slave-risings, most of them occurring in the remote age when city editors were Simon Legrees. In the days when Thomas Lamont, Frank Vanderlip, George Harvey, Morrell Goddard, Augustus Thomas, Willis Holley, Don Seitz, George Ade, W. O. Inglis, Roger Farnham and Finley Peter Dunne were mere reporters, the tribe doubtless required stern and strict treatment to keep it within bounds and out of jail. The present-day newspaper men, apart from the unregenerate columnists, seem to have no vices at all. Another grotesque episode was long talked of in the World office. Nym Crinkle, the wittiest writer of his day and then the World's dramatic critic, had written a clever article on Jem Mace, the famous pugilist, in which Mace was referred to several times as a savant. Harry Hill, to whom the pleased fighter showed the story, informed him that the word meant all that was unprintable, unpopular and abhorrent, whereupon Mace started downtown. "I want to see the ——— that wrote that!" Sutton informed him that Nym Crinkle (Andrew C. Wheeler) had written it and that he would not be down until the afternoon. "All right. I'll wait for him!" growled Mace, taking a chair. "Say, does this Wheeler bloke ever lose any of his bloody wheels? You tell me where he lives, and I'll go git him!" "You big bum! Whadya mean by raisin' hell round a swell joint like this? Who've ya been beatin' up, you dirty plug?" "I ain't been beatin' up nobody!" protested the pugilist. "I'm a-waitin' fer a Dutchman named Bimskinkle, or somethin' like that. He's been writin' me up in the paper . . . . Here it is . . . . Called me a sayvant . . . . See, here's his name signed to it —"
Eddie glanced at the story, and then, seizing Mace's arm, led him toward the elevator. "You big tub o' guts, somebody's been goosin' ya!" he roared. "That sayvant thing means pachydermatous, and that means about as high-toned as they make 'em. You never had as fine a send-off in your life, you blitherin' ape! Get outa here before you get ashamed of yourself!" "If you come up here beefiin' about anything again, I'll lam your bloody conk off ya!" "Hi, Eddie, tell that Dutchie I thought it was a good piece, all but that sayvant part —"
Those were happy days! 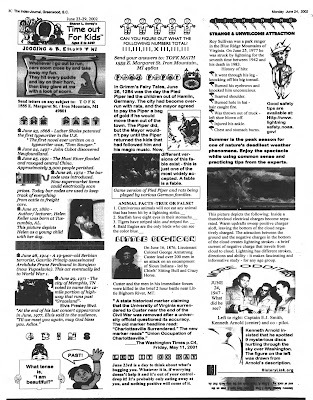 Nothing to do save a daily cartoon, some illustrations for Bill Nye's stuff, some more for an article by Jim Townsend or Gil Van Tassel Sutphen on Mrs. Astor's ivory carvings, then luncheon with kindred indolent souls at Mouquin's in Fulton Street, where a battle of Pommard or Beaunne cost but a dollar, then the launching of a new battleship by Secretary Whitney over at the Navy Yard, then a sketching jaunt to Coney Island, an unfailing bonanza, then a test of Paul Boyton's swimming suit off the Battery, then the Horse or Dog Show, the quest for a fabulous wild man at Far Rockaway, a juicy murder up in the wilds beyond Goshen, a trip with Nellie Bly to the insane asylum at Blackwell's Island, a society wedding, an hour in Recorder Smythe's or Judge Goff's court with the astonishing Bill Howe pleading, and finally, after dinner, a boxing bout at Coney Island or Pain's Fireworks at Manhattan Beach. Pains Showreel from Pains Fireworks on Vimeo. After the Evening World was established, I had an additional cartoon to make every day, the "Daily Hint from McDougall." Often enough it would take me hours to find an idea for it and twenty minutes to make the drawing. Of course, these drawings were all atrocious. 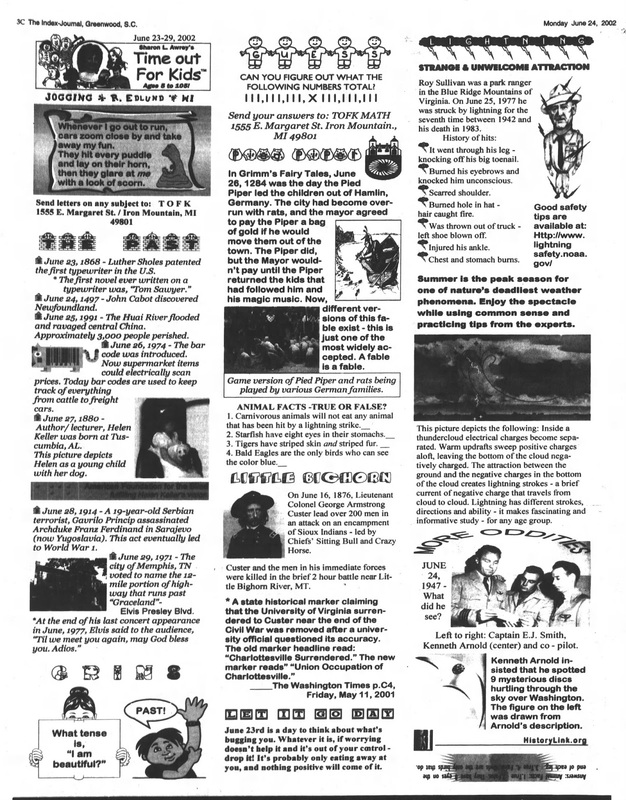 This was the Neolithic Period of newspaper art, and we were Cro-Magnon draftsmen. Nevertheless, although forty years have passed, newspaper illustration in general remains almost as crude. The high-hat artists of Harper's, Frank Leslie's and Puck looked down at us as beneath contempt; this was when an Academician still scorned to do an advertising picture, but in time even these fell for the lure of regular meals and sure rent-money, and we inscribed on our rolls many names of distinguished members of the Palette, Kit Kat and Salmagundi Clubs. Glorious days in vast untrodden, unexplored fields, just like airplaning ten years ago—the days before the Partition had been invented to give the editorial head the permanent "waive" and part him from eager contributors—when any man or woman with an idea was welcome as the flowers of May in an editor's room and his suggestion was considered, when Inspiration dwelt after dark in Andy Horn's cave, Tom Gould's grotto, Theiss's Palm Garden or Billy McGlory's hectic hell. Clare Victor "Dwig" Dwiggins' comic strip career began in earnest in 1900 at the Philadelphia Inquirer, where he created a number of features for their recently born color comic section. One of the longer lasting was Gallant Cholly (or often just Cholly), in which our hapless hero tries to impress a young lovely with his chivalry, only to be rebuffed, and often beat up, arrested, or both, for his trouble. Dwig's great facility with slapstick made the strip, I imagine, work of very little effort for him. Gallant Cholly ran from March 17 to November 17 1901. The above sample, which is from the collection of Cole Johnson, was the last installment of the series. Sorry about the condition, but this is the sort of thing you must occasionally expect for such rare early material. After his stint at the Inquirer, Dwig switched most of his attention to book illustration and postcard work, and didn't return full time to newspaper strips for close to a decade. PS: won't someone please fix Wikipedia and Lambiek's lame Dwig entries, both of which make the ridiculous statement that his first comic strip was School Days? Sheesh! That's even worse. Dwig's first comic strip was in 1918?!?!?!?! Just look 6 inches up from here to see a series he did 17 years earlier than Tom Sayer and Huck Finn. Why not be a car­toonist ? Easy work and good pay—we teach you in ten easy lessons. Anyone who can draw can earn from three to five hundred dollars a minute drawing cartoons. Easy as rolling off a log. Write for particulars — that's the way the ad reads, so why not ? To make a cartoonist, take one good editorial writer and mix with two barrels of nerve, one bushel of talent for drawing, a ton of humor, and an equal proportion of patience. Shake thoroughly before using. After hanging over a drawing-board for about seven years and wasting a number of gallons of good ink and several thousand sheets of bristol board, go out and separate some gullible editor from a few frog-skins per week in exchange for your masterpieces. And then read the criticisms on your own editorial page from "Constant Reader." After you get the job you hie yourself to the office at 7 a. m., grab all of the morning papers, and proceed to dig up an idea. Possibly the boss has requested something very funny for that day, and after scanning the columns telling of murders, suicides, divorces, hold-ups, accidents, and tales of woe, you wonder if there is really anything funny to draw about. After finishing the papers, you proceed to walk some ten or twenty miles up and down and around your sanctum— all the while looking for that funny idea. It's a great indoor sport, this idea chasing. Chew up several cigars. That helps sometimes. 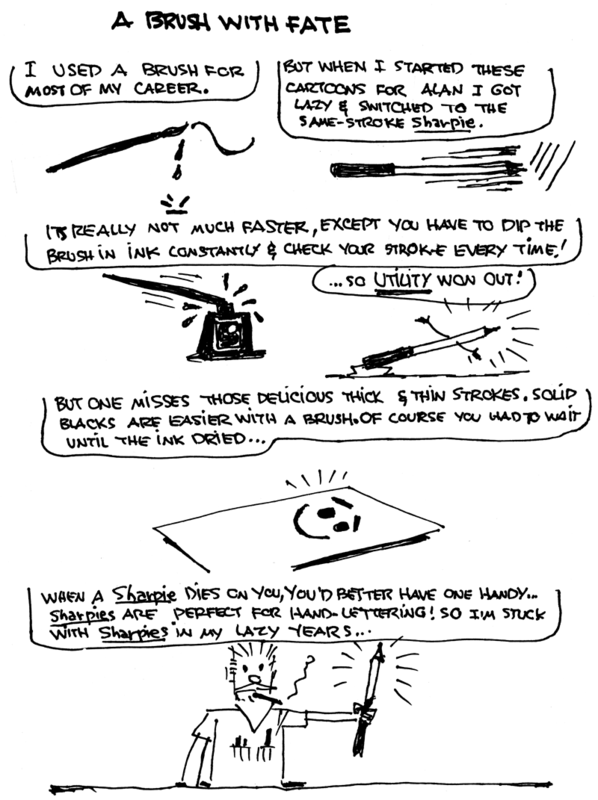 Pull a little hair out, too—if you are a real artist you can spare some. Then, when the boss shows up, put on a brave front, grin as though you thought this particular idea was the best ever, and walk into his office, walk around and look at the books and pictures with a nonchalant air. Then suddenly you are nearly startled out of your skin by a roar: "Get something NEW for a change, can't you ?" After that go back and chew up some more cigars and walk a little—a cartoonist's life is an active life. Oh, dear me, yes! Later on in the day—if you are doing general stuff— you will have several callers, each with about two days work, and each telling you that "It will take a few minutes, and please rush it." After that you get your cartoon roughly sketched. About the time when you are ready to "ink in," one of the engravers will come over and sit on your table and ask "How soon?" Then he will immediately start to tell you a better idea — oh, much better — that he thought of "this morning in the saloon around the corner." If you happen to be drawing for a certain pink sporting weekly found in barber shops and saloons, you might be able to use the idea—after a little toning down. Then spill the ink onto your cartoon for about fifteen minutes, and tell the boy to take it to the engraver and to be careful not to step on it, and not (shout this) NOT to attempt to cut his initials in it or change the spelling. Then you are through—with the cartoon — and after that you go to work. 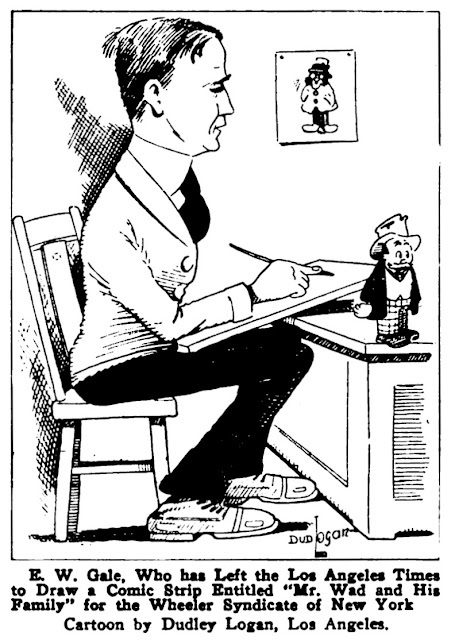 But with all the trials and tribulations, the life of a cartoonist isn't so bad — if you really have the "bug"—and when at the end of the day you slip into the editor's office and hear him dictating a letter to his secretary, in reply to an applicant for your job, to the effect that Mr. You "is our cartoonist and we are well satisfied with this same Mr. You," you can go home at 1 a. m., lugging a little package labeled "encouragement"— and the thought, "Nothing to do until to-morrow." All in all, it's like any other work game of this busy world of ours. You have your happy days, your dull days, and the days when everything goes wrong, but still there is a lot of sunshine working in through the windows and you always turn out your cartoon, the general stuff wanted by the news department and the business office without trouble. You find a lot of good in the world and it seems easy finding for the cartoonist, and you should feel pretty well satisfied. You generally discover that all of your troubles of the day are little troubles, and, as said before, if you really have the "bug" you'll find that it is a game worth while. There is something in the feeling that you are a part of the big world and are taking part in its daily work. After a successful career in the music store business, Sharon Awrey decided she'd like to write for kids, and she chose newspapers as her outlet and self-syndication as her method. She is credited in her 2003 obituary with three series; Wojo and Penelope, Pling and Time Out for Kids Ages 5-105. Time Out for Kids (see below) is primarily text and photos, and seems to have been by far her longest-running feature. On the other hand, I haven't yet come across any papers that ran Pling. It apparently ran in the Iron Mountain (MI) News, but I haven't found a way to access that paper's archives online. What I do have access to is Wojo and Penelope, which was a daily comic strip about a group of kids, and featured simple gags that would primarily appeal to the under-10 year old crowd. 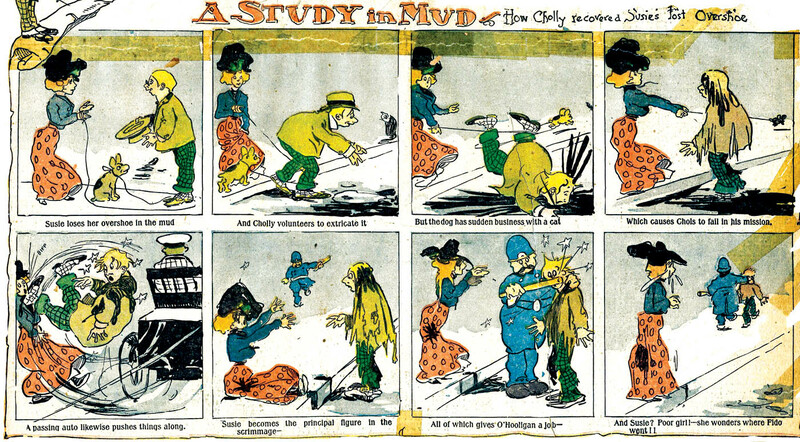 Awrey enlisted the aid of veteran artist Harold Elder, who was nearing the 70-year mark, to draw the strip in a simple and accessible style. Based on my files, the strip ran in the Milwaukee Sentinel from December 16 1982 until at least July 1983. However, an introductory story about the strip in the Sentinel claimed that it started a month earlier in the Iron Mountain News, so figure sometime in November 1982 as being the official start date. 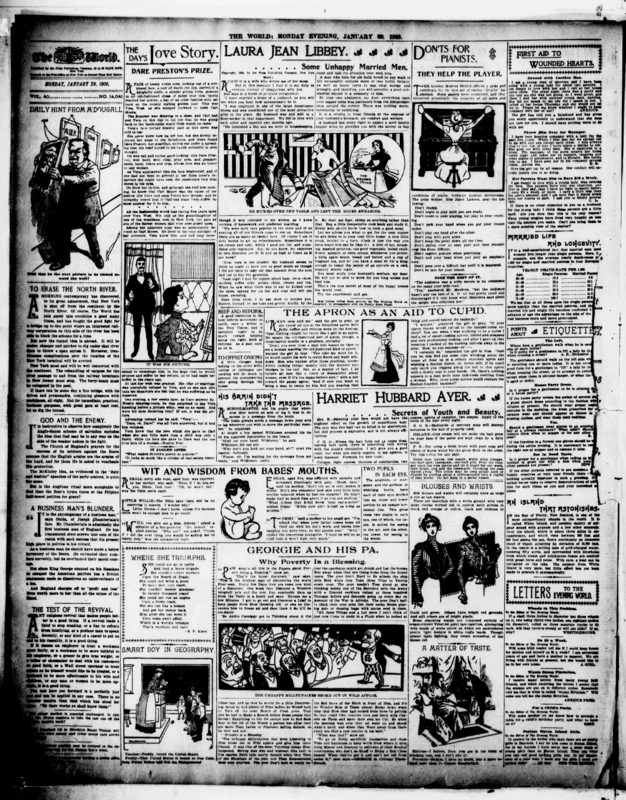 I imagine that Awrey's connections in Michigan, and Harold Elder's connections at newspapers in the Milwaukee / Green Bay area, were instrumental at getting the strip in the papers it did. They evidently weren't enough to make the strip a paying proposition, though. If anyone has information on the end date of Wojo and Penelope, or hard evidence of Pling appearing in newspapers, do please let me know! Edmund Waller “Ted” Gale Jr. was born in Corydon, Kentucky, on December 28, 1884, according to his World War II draft card. In the 1910 census, Gale continued to live with his parents at the same address. 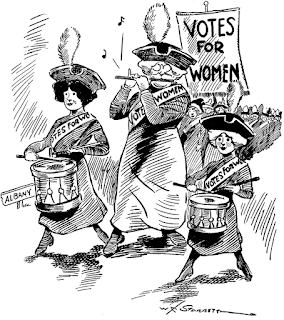 Gale’s occupation was cartoonist with the Times. 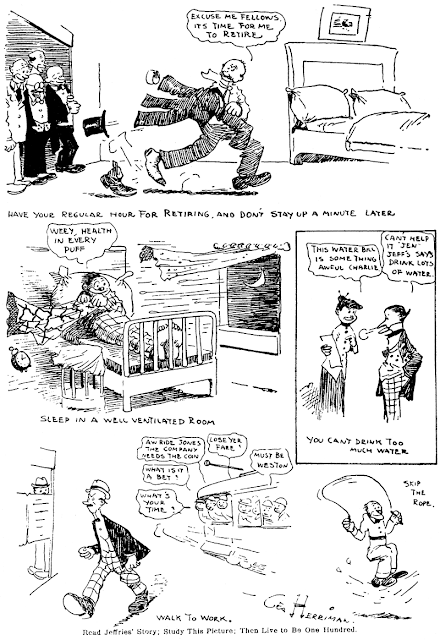 American Newspaper Comics (2012) said Gale’s strip, The Wad Family, began in the Times on January 22, 1911 and ended in 1919. A visit to the Los Angeles Times plant to look at how an illustrated daily newspaper is produced, including cutting and engraving, typesetting on linotype machines, printing presses, and a view of the cartoonist “Gale” at work. Gale produced the weekday strip, On the Five-Fifteen, from January 2 to June 29, 1917. On September 12, 1918, Times cartoonist Gale signed his World War I draft card. He and his wife, Helen, resided at 208 North Grand Avenue in Los Angeles. The description of Gale was tall, medium build with light gray eyes and light brown hair. Gale’s occupation and address were unchanged in the 1920 census. 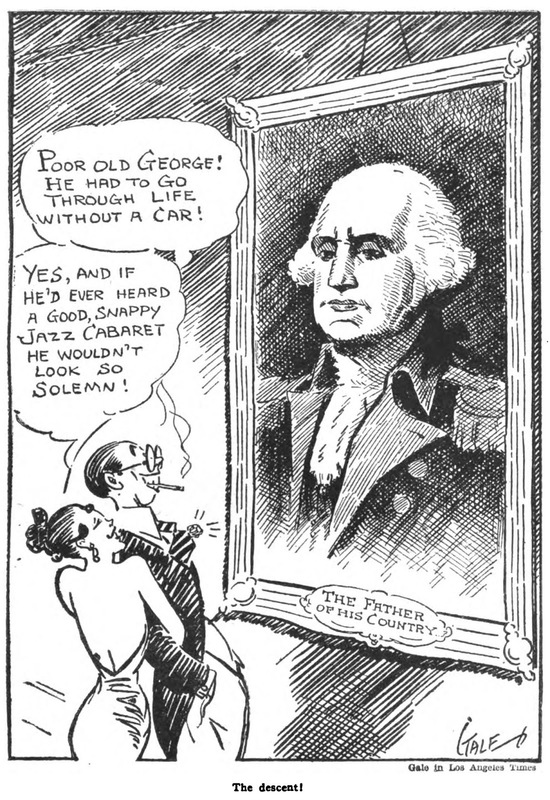 Cartoons Magazine, March 1921, reprinted Gale’s George Washington cartoon. 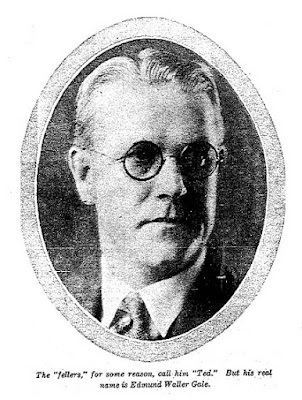 According to the Michigan Alumnus, October 8, 1927, Gale’s father passed away June 3, 1927. A photograph of Gale Sr. is here. Gale’s residence was the same in the 1940 census and on his World War II draft card which he signed on April 25, 1942. Gale stood six-feet tall and wighted 174 pounds. Gale passed away September 4, 1975, in Los Angeles, according to the California Death Index at Ancestry.com. Brush... sharpie... crayons... just keep 'em coming!